NEW DELHI (IDN) – By any yardstick of human and social development, Kerala in South India is ahead of most Indian states. It provides social security to all sections of employees and workers through schemes that are superior to what obtains in most other states. Its labour policies are progressive. Minimum wages, especially, for unorganised, and even unskilled workers are higher – perhaps the highest, than in any other state. Healthcare and education are good, and there is no dearth of opportunities, especially, for low-end work, which pays well and is a sustainable long-term proposition. Yet, the cost of living is not high. All these factors have made Kerala India’s most attractive destination for the lakhs (one hundred thousands) of rural poor who are migrating in search of work for survival, and are looking for a place, where they can live in peace without exploitation and persecution. The migrant workers, who land up in Kerala also face relatively less prejudice, hostility and discrimination than they would elsewhere in India. There is no religious and communal polarisation in Kerala; and, women and children are not in danger of predatory sexual violence of the kind they are exposed to everyday in northern India. Therefore, it is not surprising that a majority of those, who make up Kerala’s migrant workforce, are people belonging to the Scheduled Castes, Scheduled Tribes and minority communities coming from as far off as Uttar Pradesh in north and Assam in northeaster India, and as near as Tamil Nadu and Karnataka in the country’s south. Kerala’s economy is critically dependent on migration – internal as well as external – and is in a peculiar class by itself. On the one hand, there are the nearly 3 million Malayalis abroad, whose remittances sustain their families at home and also the state’s economy. On the other hand, there are, on present reckoning, the 2.6 million inter-state migrant (ISM) workers in Kerala doing the low-end jobs that Malayalis are engaged in abroad, especially the Gulf and Saudi Arabia. A study by the Ernakulam-based Centre for Migration and Inclusive Development (CMID) found that during 2016-17, there were migrants from 194 districts across 25 states and Union Territories working in Kerala. More than four-fifths of these districts belong to the eight states of Tamil Nadu, Karnataka, Odisha, Jharkhand, Bihar, Uttar Pradesh, West Bengal and Assam. The migrants included single women and girls, senior citizens and families. Murshidabad in West Bengal is one of the major sources of migration to Kerala. The CMID research on the labour dynamics of migration showed that the main areas, from where workers come to Kerala, are also known for floods, cyclones, droughts and conflicts. Journalists, who as part of an Inter-state Media Study Tour, travelled recently to the ISM hubs of Thiruvananthapuram, Alappuzha, Ernakulam and Palakkad, saw that while these migrants have been accepted as an inevitable part of Kerala society, their presence poses many challenges. The media tour was to provide an idea of the government’s responses to these challenges by way of policies, strategies and schemes. Some of the schemes have been commended for being the first such in the country and, perhaps, even in South Asian Association for Regional Cooperation (SAARC). Sree Lal, Regional Joint Labour Commissioner, told the visiting journalists in Ernakulam that construction, hospitality, plantation, iron and steel, wooden furniture, marine fishing, mining and quarrying, plywood, textile and apparel, seafood and footwear are the major sectors employing a large number of migrant workers. From January 2018, the government has given effect to a unique health insurance scheme for migrant workers called ‘Aawaz’ (‘Voice’). Lal said that this first-of-its-kind scheme in India provides the worker free medical treatment up to an equivalent of about Rupees 15,000 (about USD 221). Their work entails arduous physical labour and they are at high risk of accidents, injuries and even death. Along with health insurance, the worker gets accident death claim coverage of Rupees 2 lakh (USD 2,947). Till end of March 2018, nearly 200,000 workers have registered in the scheme. Another scheme of the Kerala Government, ‘Apna Ghar’ (Your Home) aims to provide good quality, hygienic and safe living space at affordable rent. The Apna Ghar project we saw at Kanjikode in Palakkad is a hostel for 620 migrants spread over 44,000 sq ft. Each of the 62 rooms can accommodate 10 persons and the rent is Rupees 800 (about USD 11.8) per month. The hostel is well provided: 32 kitchens with cooking facilities, eight mess areas, 96 toilets, four common bathrooms with showers on each floor, round-the-clock security and spaces for recreation, rest and sports. The construction seems as good as those in top educational institutions. Project Officer Niranjan Nair said that the Apna Ghar scheme is being extended to other areas where ISM workers are concentrated. Three new schemes of about 1,000 beds each are coming up in the districts of Ernakulam, Kozhikode and Thiruvananthapuram. Subhash TV, Director of Information & Public Relations said that studies showed Kerala to be one of the most promising destinations for migrant workers from the major states known for out-migration. Given Kerala’s labour shortage, this migration is only likely to increase, he added. According to a 2013 study of the Gulati Institute of Finance and Taxation – made available by the Department of Labour and Skills – there are over 2.5 million migrant workers in Kerala, from not only other states, but also Bangladesh and Nepal. In 2016, migrant workers were reckoned to be 4 million with an annual arrival rate of 235,000. 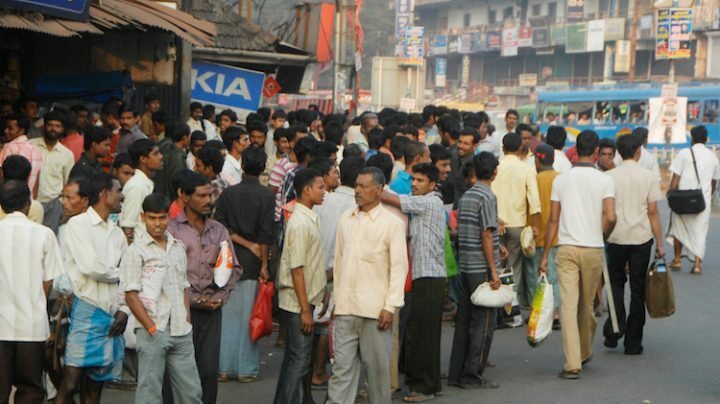 By 2023, the migrant workforce could rise to 4.8 million, about 15 per cent of Kerala’s population in 2011 (33 million). Kerala’s Labour Minister T P Ramakrishnan told the visiting journalists that the ISMs called “guest workers” are “very much part of our society.” He mentioned Kerala State Literacy Mission’s “second revolution” – the Changathi scheme to teach Malayalam to these guest workers. Changathi means friend in Malayalam. Ramakrishnan said that there is no discrimination against the guest workers and everything is being done to ease their integration in the state’s economic and social culture. The larger aim of the Changathi programme is to ensure that they do not feel alienated. By first learning to speak and then being taught to read and write in Malayalam, they would be able mingle and move about more freely with the people of the state. He said that Kerala needed the labour in-migration and it was implementing migrant-inclusive policies and programmes. “The inclusion of migrant workers is a collective responsibility and not that of the government alone,” Ramakrishnan said. Even in Kerala, despite the government’s proactive measures for the welfare of migrants, they do experience harassment and exploitation. All sections of society in Kerala need to be made aware and sensitised that the migrant workforce is pivotal to the state’s economy; and, that a people who have benefited as migrant labour elsewhere must embrace and ensure a place for migrants in their own state. As much as economic development, Kerala’s human development also is dependent on how quickly the migrant population is integrated, educated, empowered and enabled to attain a standard of living in keeping with the state’s present level of development. The migrants, who see their future in Kerala, may well determine Kerala’s future.